The photograph on the right has been in the family for a long time. 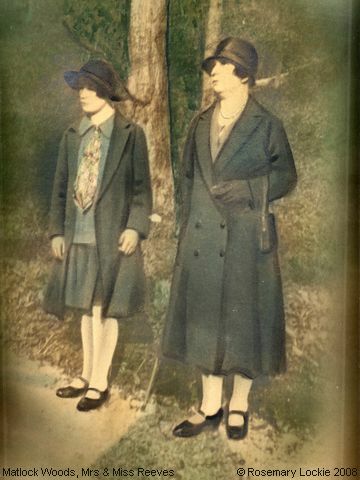 It's a hand-tinted enlargement of my mother (“Miss Reeves”), and her mother (“Mrs Reeves”) on a day out in Matlock ‘Pleasure Grounds’ in a frame. For as long as I remember, it was kept out of sight in the wardrobe, as my mother found it dark and depressing, although this has probably helped to preserve it! I'm uncertain of the date, but would guess the early 1930s. It never occurred to me until after I'd scanned it to set it beside the one of my mother and I taken after my Graduation, but when I did so, I could only marvel at the similarity of the compositions - two figures, standing side by side, and leaning ever so slightly towards each other, one a little taller than the other, albeit in very different circumstances. 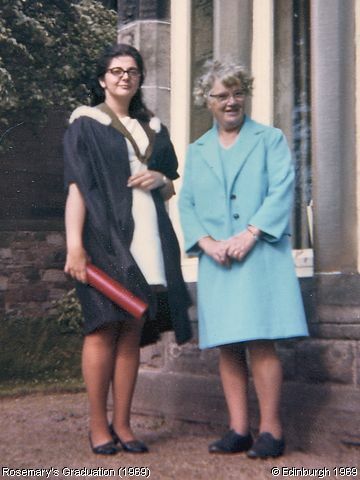 The ladies fashions are of course radically different too... but interestingly, my mother's skirt - such an issue for her, at my graduation, is around the same length on both!